Star HD 142527 probably struggles to find maternity clothes in its size. A team of scientists from Japan’s Osaka University has been observing the star from Chile’s ALMA observatory, where they’ve noticed some pretty unusual cosmic behavior. 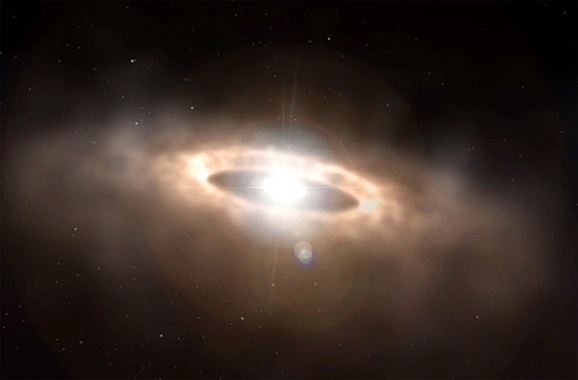 Star HD 142527 is over 450 light years away and is surrounded by a ring of dust and gas. That ring isn’t uniform — in fact, the northern part of it is brighter and denser than the rest. That portion of the ring is over 20 billion kilometers away from the star itself, which surprised the team. The astronomers have never before observed such a dense collection of material in a ring so far away from the central star. In this case, that dense knot is about five times as far from the star as Neptune is from the sun. Such dense clusters of material can form planets and comets, events that typically take place closer to a central star. The scientists have been taking measurements of the temperature and strength of the submillimeter-wave radio emissions and believe that, right now, planets are being born inside that dense pocket. 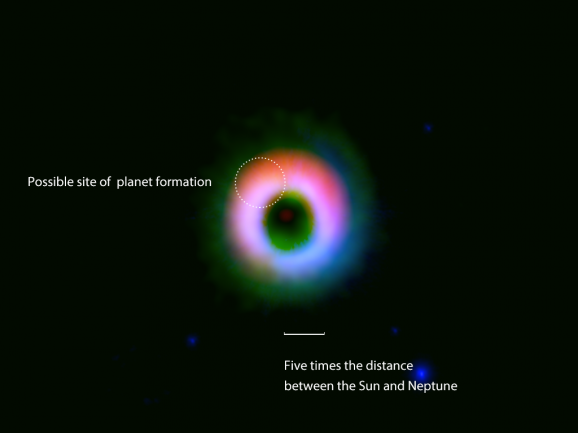 If the ring traps a large amount of dust, the newborn planets will most likely be rocky, but such a dense region can also attract tremendous amounts of gas, which would result in the formation of giant planets such as Jupiter. That sounds like a pretty painful labor!